Penn State Altoona’s Sarah Gearhart delivers a pitch. Gearhart, a graduate of Mount Union, is one of many local softball players succeeding at the college level. Mifflin County High School product Hannah Ruby had hoped to pick up right where she left off last season with the Mount Aloysius College Mounties. 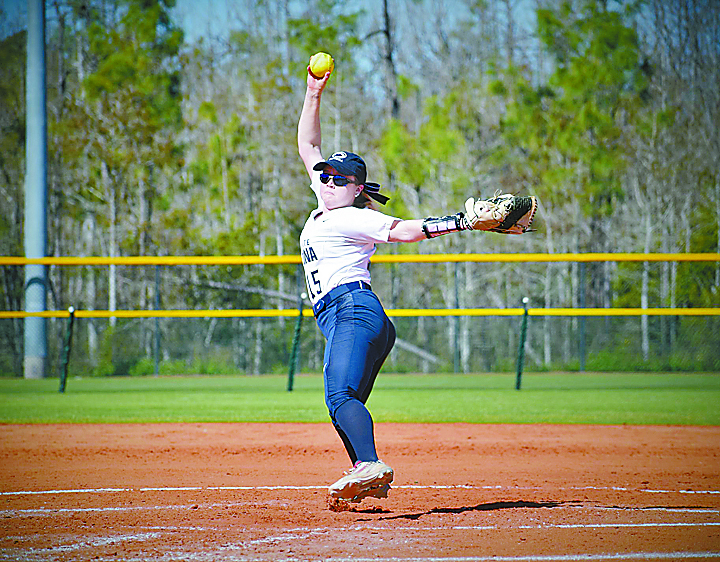 The Belleville native was a workhorse in the circle in 2018, putting together an 11-5 record with a sparkling 2.10 ERA and 94 1/3 innings pitched, leading the Division III school to its first Allegheny Mountain Collegiate Conference softball crown. The Mounties also earned a bid to the NCAA Regionals. Ruby was named to the all-AMCC section team as a pitcher. Her 11 wins were fourth-best in the conference, despite appearing in far few games than those above her. Ruby dominated conference opponents as she picked up seven wins with a 1.66 ERA. Ruby also did well at the plate, batting .337 with two home runs and 17 RBIs. She was named to the all-tournament team for both the conference championships and the regionals. “Although we had a great year last year as a team, personally my goal for this year is to improve my consistency on the mound and work to make a larger impact in the batter’s box,” Ruby says. Ruby final season didn’t start the way she hoped. She left in the first inning after suffering an injury, allowing two runs and four hits in one inning in a 6-5 loss to Albertus Magnus. The Mounties rebounded to beat SUNY Poly in the nightcap. Currently, Mount Aloysius is 6-1 on the season. “Although this season is going to be bittersweet because my softball career is coming to an end, I’m very excited to have the opportunity to play alongside some of my best friends for one last season,” Ruby said. Ruby is hardly alone as a local softball player who made the transition from high school to college. There are quite a few, actually. Sarah Gearhart and Alexis Secrest were teammates while playing high school softball for Mount Union. In fact, they’ve been almost inseparable since youth leagues. The Trojan tandem has taken their game to Division III Penn State-Altoona this spring. Having Secrest around has made the transition easier, Gearhart said. Both are out for the first time at the college level. Secrest, who played left field in high school, is a sophomore but opted not to play softball last season; Gearhart is a freshman. The Lady Lions started 1-4 but have reeled off wins in six of their last seven games to improve to 7-5. Gearhart has sparked that turnaround, sporting a 2-2 mark with an 8.04 ERA and five strikeouts and seven walks in 15 2/3 innings. Gearhart tossed a complete game in a 11-1 rout of Elms College that took only five innings. She struck out two and walked two. Offensively, she also went 2-for-3 with two RBIs and two runs scored. After getting roughed up in a 13-4 loss to Kenyon College, Gearhart rebounded to pick up the win in relief against Drew University. The Lady Lions scored two runs in the top of the seventh inning then watched as Gearhart held Drew scoreless. Secrest has not played to date. Their spring road trip to North Carolina and Florida was certainly different than traveling the Inter-County Conference circuit. At first, Gearhart found it a bit strange seeing former ICC rivals sporting the same uniform at Penn State. A few of her new teammates hail from Moshannon Valley and Glendale. Others come from District 6 foes like Philipsburg-Osceola, Penns Valley and Bald Eagle Area. Both have learned to manage their time, balancing schoolwork with a rigorous softball schedule. Gearhart and Secrest might have their eyes set on winning an AMCC crown, like Ruby did last year at Mount Aloysius College. Former all-ICC catcher Diana Rorer is another Mount Union product who playing at the next level. Roher is a freshman at the University of New England, located in Biddeford, Maine. The Division III Nor’easters compete in the Commonwealth Coast Conference. UNE is coming off a 17-20 campaign and finished fifth in league play with a 10-8 mark last year. It didn’t take long for Roher to see her first action. She struck out in the second game of a doubleheader with Swarthmore College, a 10-2 defeat. UNE dropped its first two games of the season before rebounding to beat Mount Saint Vincent, N.Y., and UMass-Dartmouth. “We are just starting our season with spring training in Florida, but I imagine it’ll be a little comfier because of not taking a regular school bus and being squished between everyone’s gear,” Roher said. UNE is 2-2 overall. Roher only has the one at-bat to date. She understands that she must bide her time, but she is ready to contribute when called upon. Brooke Louden is majoring in family studies, but the Greenwood High School product might consider changing to geology after all of the gems she has tossed this spring. Louden, now a junior at Division III Bridgewater College (Va.), has gotten the starting nod four times, and four times she has been dominant from the softball circle. Louden is 4-0 for the Eagles, with a miniscule 0.62 earned run average, striking out 12 and walking 6 in 22 2/3 innings. Overall, Bridgewater is off to 9-3 start to the 2019 campaign. “The biggest difference between high school and college softball is the competition level,” Louden said. “Bridgewater is in the Old Dominion Athletic Conference, which in my eyes is one of the most elite Division III conferences. The conference has many talented teams, including one (Virginia Wesleyan) that is a two-time NCAA Division III champion. Bridgewater opened the season by hosting Penn State-Altoona, whose roster included Gearhart and Secrest. The locals did not face each other in the twinbill. The Eagles won the opener 8-0 as they chased Gearhart after four innings. She was charged with seven runs and walked two. Louden pitched the second game, a 9-1 victory as Bridgewater swept the doubleheader. She went three innings, allowing one earned run, striking out three and walking none. Louden earned her second win of the season after pitching all seven innings against Dominican University. She scatted three hits, struck out six and walked two in a 3-0 shutout. Louden’s third and fourth wins were also both gems. She scattered four hits, struck out three and walked one in a complete-game victory over Mitchell College. Bridgewater rolled to a 19-0 win in five innings. Louden also helped herself out at the plate by going 1-for-4, with a double, RBIs and two runs scored. In a 3-1 decision over Thiel College, she scattered six hits, gave up one earned run and walked two in 6 2/3 innings. With a team ERA of 2.02, pitching is definitely one of the Eagles’ strengths. Louden has worked hard to improve her game. Last season, Louden made 12 starts in 13 appearances for the Eagles. Finishing 5-5, she led the pitching staff with 32 strikeouts and seven complete games and finished second with 65 2/3 innings pitched. She also hit .370. As a freshman, Louden started 14 times in 20 appearances, leading the team with 93 2/3 innings pitched and 38 strikeouts. She also tied for the team lead with four wins. Louden completed seven games and pitched at least six innings in four consecutive games. ¯ Emily Bingman (Burnham/Mifflin County) and Analisa Yoder (Belleville/Mifflin County) are both freshmen at Division III Rosemont College, near Philadelphia. Both have started all eight games for the Ravens, who are off to a 1-7 start. Bingman is hitting .240 with two doubles, four RBIs and six runs scored. She singled to center in her very first college at-bat of her first game, a 7-6 loss to Mitchell. Bingman also went 2-for-2 in a 10-1 setback to Elizabethtown. She has caught and played second and third base. Yoder sports a .222 average with a triple, two RBIs and four runs scored. She went 1-for-4 in her first college game then hit 2-for-3 in an 8-2 loss to Houghton College. Yoder has played first base and outfield. ¯ Eleana Eckley (Lewistown/Mifflin County) is a utility player at Division III Messiah College. The freshman has not played in any games for the Falcons, who are off to a 4-2 start. ¯ Corissa Wagner (Millerstown/Greenwood) is a freshman utility player for Division III Medaille College, located in Buffalo, New York. She has started all four games for the Mavericks, with an .857 fielding percentage. Despite being hitless in nine at-bats, Wagner has scored two runs, walked once and stolen a base. Medaille, which is a member of the AMCC along with Mount Aloysius and Penn State-Altoona, is 2-2 this season.